The ISOMETER® of the isoPV series is designed to monitor the insulation resistance of ungrounded main circuits (IT systems) AC, AC/DC 0…793 V resp. DC 0…1100 V. Solar systems containing inverters and isolating transformers are often designed as IT systems. iso-PV variants using the AMPPlus measurement method capable of adapting to slow voltage fluctuations meet the particular requirements of modern solar systems. Due to wide spatial distribution or EMC interference suppression methods often high leakage capacitances against ground occur in these systems. Considering this, the isoPV automatically adapts to the system conditions in order to optimize the measuring time. In particular, the requirements for permissible voltage ranges along with a low level of insulation can be met here. 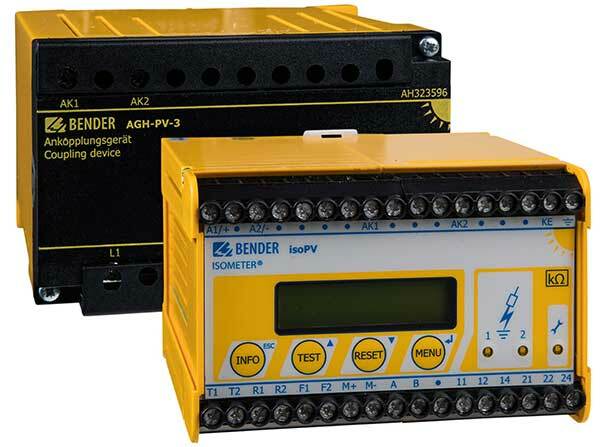 Use the ISOMETER® isoPV in combination with the AGH-PV only. An external supply voltage allows de-energized systems to be monitored too.